Quotations are everywhere. You can always pretend you know something about physics by quoting Einstein: “God does not play dice“. Or if you feel like contributing to a discussion about statistics you can assert that “all models are wrong, but some are useful. There’s a quotation for every occasion. In fact, Oxford University Press (OUP) has its own dictionary of quotations. (Although OUP has a dictionary for pretty much anything.) But if one quotation has been mercilessly abused, it has been that of Dobzhansky. You know which one, the one starting with “Nothing in biology…”. It all began when Theodosius Dobzhansky became the president of the American Society of Zoologists. In his presidential lecture he raised some concerns on the emerging field of molecular biology, of which he said it was a ‘glamour field’. He worried that ‘[t]he notion has gained some currency that the only worthwhile biology is molecular biology. All else is […] “butterfly collecting”‘, in clear reference to Rutherford’s “stamp collecting” statement. Towards the end of his address, he concludes that molecular biologists focus more on ‘how things are’, and organismic biologists on ‘how things got to be that way’, but that both views are complementary, and a Darwinian approach is needed to understand also molecular biology. In his words: ‘nothing makes sense in biology except in the light of evolution, sub specie evolutionis‘. The ending of the sentence, ‘in the light of evolution, sub specie evolutionis‘, originally comes from Julian Huxley. He paraphrased Spinoza, who described all the things that are universal and eternally truth as sub specie aeternitatis (from the point of view of eternity). Huxley coined the concept of sub specie evolutionis and translated it as ‘in the light of evolution’. But Dobzhansky slightly modified his own version of the sentence and use it as a title of a very influential paper he published in 1973, introducing to the World what it will become his most famous statement: “Nothing in Biology Makes Sense except in the Light of Evolution“. The nightmare began! We find variations of all kinds. Apparently not only biology makes only sense in the light of evolution. 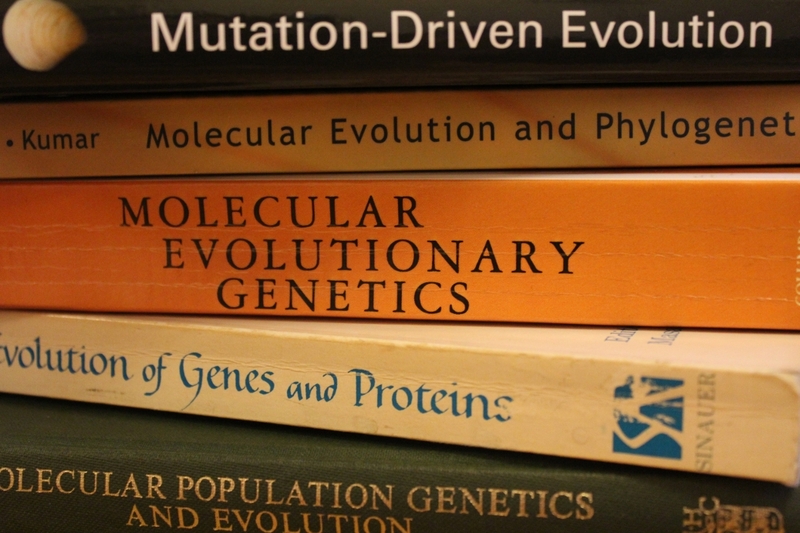 Some authors assert that neither ethics, glycobiology, medicine, morality, biochemistry, microbiology, cancer, nor community ecology, makes sense except in the light of evolution. Some other swap the sentence around, and say that nothing in evolution makes sense except in the light of population genetics, of phylogeny or even of creation! One of my favourites (which I recently discovered via Tom Cameron) is ‘Nothing in evolution or ecology makes sense except in the light of the other‘. But that’s not all. The structure ‘Nothing in X makes sense except in the light of Y’ has been recycled over and over again. Some are clever, like ‘Nothing in genetics makes sense except in the light of genomic conflict‘. 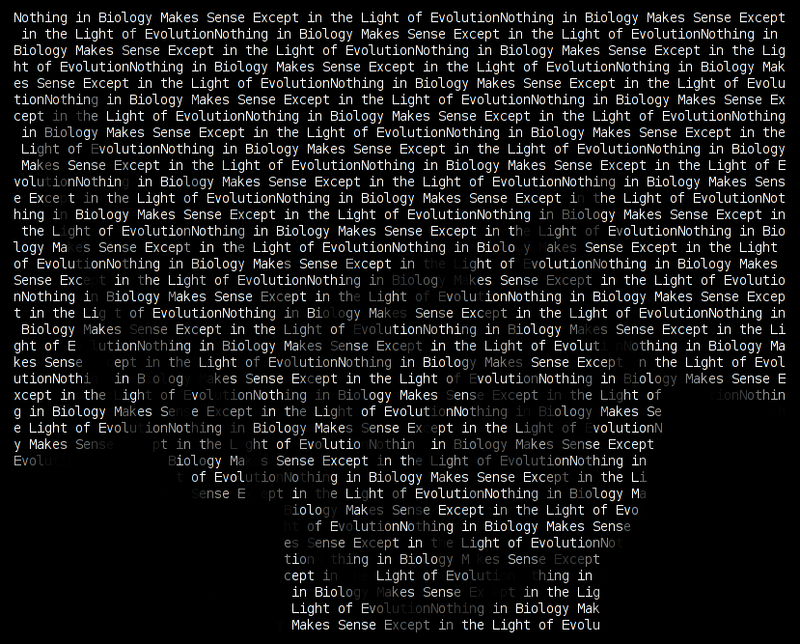 Some are not that clever, like ‘Nothing in biology makes sense except in the light of sequencing‘. And some others are, in my modest opinion, just wrong, like ‘Nothing in the genome makes sense except in the light of the transcriptome‘. Outside the biosciences there have been many attempts to create Dobzhanski-alike sentences. ‘Nothing in linguistics makes sense except in the light of change‘, ‘Nothing in Human Behavior Makes Sense Except in the Light of Culture‘ and ‘Nothing in the universe makes sense except in the light of Big History‘ are but a few examples. One that I really support is ‘Nothing in scholarly communication makes sense except in the light of Open Access‘. On the other side are the physicists, who still struggle to find their version of Dobzhansky’s. Some go a bit far: ‘Screw Dobzhansky, nothing in biology makes sense, period‘, or its counterpart ‘in creationism nothing makes sense, period‘. In any case, I think we all have created a version of Dobzhansky’s ‘Nothing in X makes sense…’. I’ve seen hundreds of different versions, particularly in conferences and seminars. They all look clever to the eyes of the author, but probably not as much to the audience. Like this blog, which I always try to do my best, but I’m aware that most readers do not care much about what I write. After all, nothing in this blog makes sense except in the light of its author, sub species Antonii. At this time of the year I usually screen the papers I have printed/downloaded/read during the year, as an exercise to recall what has been discovered this year. 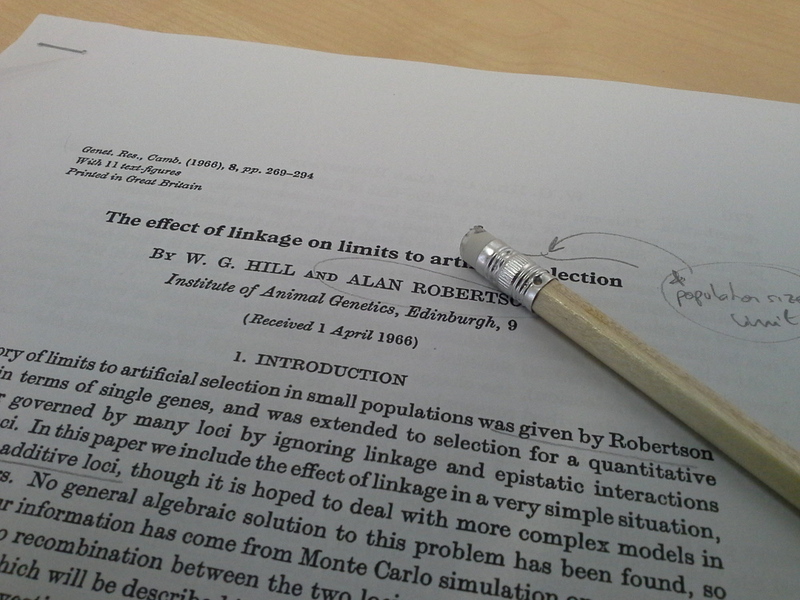 I thought that it would be a good idea to create a list of my favourite 2013 papers and post it in this blog. Obviously, this is a very personal list, and the selection is completely biased. Also, the list is not about the best discoveries or the most famous findings, so don’t expect microbrains or Lenski’s experiments. Hope you find this list, at least, informative. But before the list, I want to stress from which journals I have downloaded/read most of the papers. These are the top 10 journals: PLoS ONE, PLoS Genetics, Genetics, MBE, PNAS, NAR, arXiv, Science, BMC Genomics and Genome Res. Clearly, PLoS ONE and arXiv have a substantial impact in my field. “An Experimental Test on the Probability of Extinction of New Genetic Variants” by Ivo Chelo et al. This paper test the predictions from classical population genetics about the fixation probability of alleles in C. elegans. Very interesting combination of theoretical evolution with experimental biology. “Why Transcription Factor Binding Sites Are Ten Nucleotides Long” by Alexander Stewart, Sridhar Hannenhalli and Joshua Plotkin. It develops a population genetics model which predicts the observed length distribution of regulatory motifs. May or may not be realistic, you may like it or not, but the paper is worth reading. “Fungal Small RNAs Suppress Plant Immunity by Hijacking Host RNA Interference Pathways” by Arne Weiberg et al. This is a demonstration that genes in one species do regulate genes in a species of a different kingdom in nature. Quite amazing! “Genomic evidence for elevated mutation rates in highly expressed genes” by Chungoo Park, Wenfeng Qian and George Zhang. High transcription implies high mutation rates. Straightforward observation with deep implications in evolutionary genetics. “Sequencing mRNA from Cryo-Sliced Drosophila Embryos to Determine Genome-Wide Spatial Patterns of Gene Expression” by Peter Combs and Michael Eisen. In my opinion, one of the technical breakthroughs of the year (together with the CRISPR/Cas9 system). I feel that there will be interesting applications, but I still don’t know which ones. “Integration of new genes into cellular networks, and their structural maturation” by György Abrusán. This year has been the year of de novo emerged genes. This is, as far as I know, the first systematic exploration of the functional consequences on novel gene emergence. “Linking Stochastic Fluctuations in Chromatin Structure and Gene Expression” by Christopher Brown et al. Using a yeast system, the authors add a new layer of complexity in gene expression profiles, the random component from stochastic chromatin structures. Diffusion in population genetics: who was first? We know Motoo Kimura beause of the neutral theory. (Or should I say that we know the neutral theory because of Kimura?) But before his classic paper in 1968, Kimura was already a prominent figure in evolutionary genetics, mainly because of his productive use of the diffusion method to study the change of gene frequencies in populations. Why is diffusion so important? And who was actually the first to apply it to population genetics? Suppose that we have a large population, large enough that you can assume that it’s infinite in size. By using the so-called deterministic models one can easily compute the effects of evolutionary forces in the gene composition of such a population. Now suppose that the population is rather small. In that case, small fluctuations due to sampling will obviously influence the evolution of genes. This is known as genetic drift, and its study requires extensive computations. If you want to know how genetic drift affects to a population with mutation, selection, epistasis and/or linkage of multiple alleles, the computations become impractical or even impossible. But if you assume that the change in a gene frequency is very small during a short fraction of time, you can treat your gene frequencies as if they were particles diffusing in a continuum of probability states. This is (in a very simplistic way) the principle underlying the diffusion method. (Un-) Artistic depiction of how Fisher interpreted gene frequency distributions as continuous diffusion processes. In 1931, the prolific mathematician Andrey Kolmogorov published his celebrated probability diffusion equations (although under a different name). A few years later, William Feller fully explored the potentials of Kolmogorov’s diffusion and coined the terms forward and backwards equations to refer to the two most popular forms of these equations. As Feller noticed, Kolmogorov added an additional term to the standard heat diffusion equation. That term, precisely, is the part that Fisher missed in his first approximation and that he added later on. Kolmogorov quickly realized of the potential of his own equations to described evolutionary dynamics and published a paper about it (see comment in Feller 1951). Kolmogorov sent a reprint of his paper to Sewall Wright, who rapidly published a paper in PNAS using Kolmogorov forward equation to calculate the stationary distribution of gene frequencies. However, Wright himself preferred his integration method and his paper received little attention. Feller and Malécot showed later that Fisher’s diffusion, Wright’s integrals and the classical branching models all converge to the Kolmogorov forward equation. That is, they are mathematically equivalent. The path was ready for someone to fully exploit the potential of Kolmogorov’s equations in genetics. The years that followed were dominated by the diffusion method, and ‘proper’ mathematicians joined the ‘diffusion crew’ (Karlin, Ewens and Watterson, to name but a few). The diffusion method gained in rigour and precision. Today the diffusion method has lost some interest in favour of computational simulation. However, they are still at the core (and the heart) of theoretical population genetics. So far we could concluded that Fisher was the first using diffusion to approximate stochastic processes, not only in genetics but in probability theory. However, as also noticed by Feller, the original Fisher’s diffusion equation was first used in a probabilistic context by Albert Einstein in his classic paper about Brownian motion of particles, almost 20 years before Fisher’s account! It may be that probability as a diffusion process was a popular topic among mathematicians in the early 20th Century, and that Fisher was smart enough to adapt it to genetics before anyone else. Whether Fisher knew or not about Einstein’s approach, I have no idea. 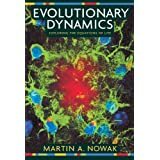 For an historical discussion on the use of diffusion equations in genetics I recommend Kimura’s review on the topic and Felsenstein free textbook on Theoretical Population Genetics. For a technical account it is often recommended Warren Ewens classic text, but I’ve found more useful the recent manual by Otto and Day on mathematical models. The later is, in my opinion, the best textbook in mathematical biology I’ve read so far. So, what is the take home message? Who we have to thank for the diffusion method in population genetics? It’s hard to summarize the contributions of the different people involved. But if I have to write a single sentence I would conclude: Fisher was the first, Kimura did the best!